Having a cracked or damaged car windshield can be more than an eye sore. Determining if you need windshield replacement or repair, windshield replacement cost and navigating your insurance policy can add to the stress of your situation. 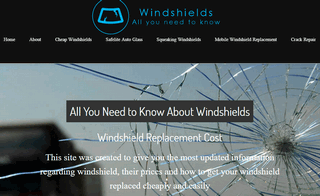 Neglecting to fix the problem isn’t the answer, but becoming informed about windshield replacement can help you determine the best result for your vehicle and wallet. The cost of windshield repair or replacement could be between $10 and $470 for the average vehicle owner, but many factors play a part in the price.